"A filling side dish that is great with chicken. It is a real family favorite in our house." 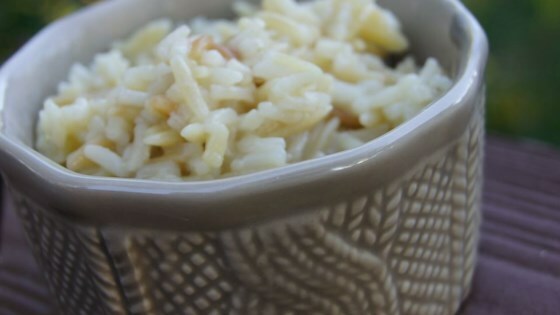 In a large heavy saucepan, melt butter over medium heat; add orzo and brown until golden. Add rice, bouillon, and water; bring to a boil, cover and lower heat to medium-low. Simmer for about 20 to 25 minutes or until all water is absorbed; serve. After reading the other reviews, I doubled the bouillon. This was good, but next time I will even add more bouillon. Great side dish. I used chicken broth instead of the boullion and water, and sauted a little onion and minced garlic with the rice. We enjoyed this change from our usual white rice. We eat this about once a week at our house. My only tip would be to add more boullion. You can use beef or chicken. Soooo good!